The route connecting London, which is in England and Glasgow, located in Scotland is well served by trains. The trains are operated by these several companies: Virgin Trains, Grand Central. 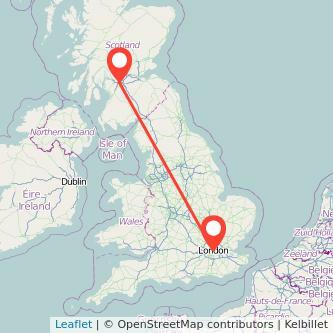 There are 345 miles between both cities and the average train duration connecting London to Glasgow is normally 5h28m. Travelling by train is normally the quickest solution to go to Glasgow from London, and it's also more environmentally friendly than taking your car or using the plane. The cheapest ticket price we've found to travel in the next month is £30.00 one way. Find the cheapest tickets to travel from London to Glasgow by train, bus, ride sharing and plane. The table above is based on the best prices found over the last six months depending on how much time in advance the train is bought. Purchasing your train from London to Glasgow in advance should enable you to spend less for your trip. We found tickets available from £39 when booking your ticket 2 months in advance which is 46% cheaper than the best ticket we found when buying your ticket on the day you're travelling. We compare train ticket for all major companies to travel between London and Glasgow by train and find the best prices for the coming days. Take a look at the prices of train tickets Glasgow to London and find the best deal for your outbound journey. Looking to travel for less? Many railcards and discounts are available to pay less for your London Glasgow train ticket and make even more savings on your tickets: special train fares for children, railcards for all ages, group travel, or charity discount. There are 5 types of railcards available: 16-25 railcard, Two together railcard, Family and Friends Railcard, Senior railcard, Disabled persons railcard. For your calculation, you must include the railcard cost, for instance £30, the discount on each trip (i.e. : 34%) and the cost of your ticket. The average cost of a London Glasgow ticket is £95.83 (1). Divide the railcard cost by the saving: £30/34%= £88. Now divide £88 by £95.83: £88/£95.83 = 0.92. It will take you on average 1 trips from Glasgow to London (one way journey) with your railcard to start saving money.